Gloves – Earlier this month I bought a cute pair of black Aldo gloves that I wanted to wear on this trip. As I was gathering my essentials for this flat lay I searched my entire home, car and office for them and can’t find them. Right when I bought them I knew I wouldn’t own them long because I am constantly loosing gloves but this may be have been a new record. Yesterday R found them in his car! But to be on the safe side I will bring these mittens with me as well so I know my hands won’t freeze. Look for the Aldo pair of gloves in the upcoming blog post about our trip. Red beanie – Hats are a must when traveling to a winter destination or else your head will freeze. This beanie was a gift from my best friend for Christmas a while back and I love the label in the front: “bad hair day”. Perfect for the many crazy hair days I have while commuting through the windy Chicago winters. Watch – I always like to travel with a watch because it’s important to know what time it is where ever you are traveling to and my phone is not always reliable. I also packed a watch for my European adventure this past summer, read post here. Warm Columbia socks – I bought these socks a few weeks ago and can’t get stop wearing them. They are quite possibly the warmest socks I’ve ever owned. I also have a tan pair and am thinking of buying a few more because they are so soft. Sweater – I have a number of sweaters packed with me, this is one of my favorites I bought a couple of years ago from J.Crew. I’m also bringing along a cardigan to layer because I guarantee I will be freezing. While we are in Toronto it will be in the mid 30sF, around 0C which isn’t as terrible as it could be but you can never be too prepared. Nine West backpack – This leather backpack was a hand me down from R’s mom. She was cleaning out her closet a few years ago and asked me if there were anything I wanted anything. That was at least four years ago and I didn’t even use the backpack until earlier this year. But I’m so happy I kept it for all those years because it’s perfect for travel and it holds all I need. Big scarf – When my mom was in town a few weeks ago she bought me this Aldo scarf and now I wear it constantly. It’s so big! I love wrapping up in it on the way to/from work and the pattern has snowflakes on it, perfect for the winter season. I can’t wait to see what Toronto has to offer and the food tour we booked! 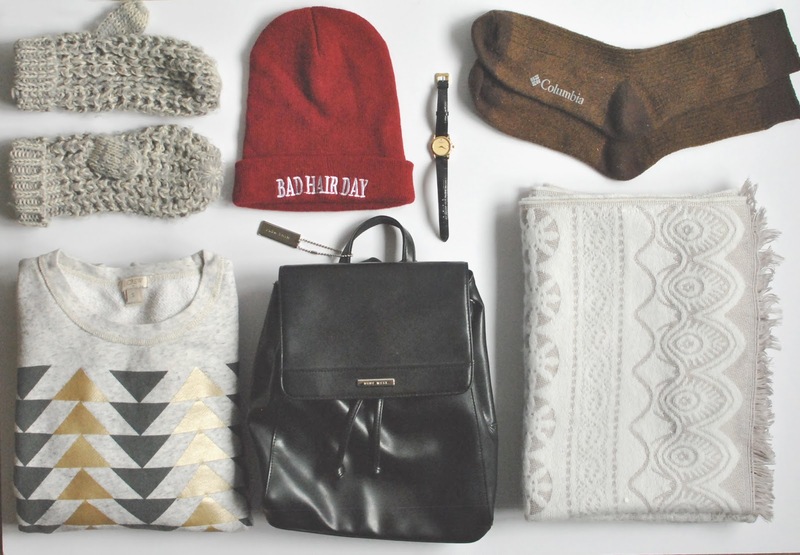 What are some of your winter essentials? *This post is not a sponsored post, these are items I wanted to share with you that I bought and love. That's such a cute watch! I'm firmly in the digital watch camp, but that's the kind I would like if I were to get an analog one. Looks like great stuff! Love the hat-I need that! Have a wonderful trip! Thank you! We had a blast in Toronto =o) The hat was much needed! 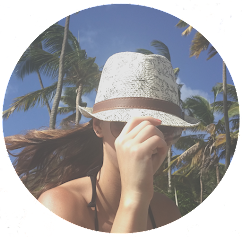 Love all these items-great pieces for your travels! And I need that hat! Have a wonderful trip! Thank you =o) Glad you think so! I love the look of those socks! Hope you are doing fine out there in Chicago. Thank you! Trying to stay warm but we have had snow fall every weekend so its been chilly. Stay warm in Germany! You're so lucky to be going to Toronto! I had the chance to visit a few months ago and I loved it. I will be going to Vancouver next year and I'm already looking forward to it. Have fun. Have fun in Vancouver! I was there only for a few hours because we were going up to Whistler to ski. It's a beautiful city! Have fun! Great article, thanks for sharing and have a greta start to the weekend! Loving all these items, especially how cozy but rugged they are. Seriously, this photo makes me want to go camping or go on a hike so badly right now! Those mittens look so warm and I love that scarf. Have a wonderful trip! Thank you! It holds so much stuff I love it! I hope you have a great time in my city! You should check out the Distillery District Christmas market if you have time. Thank you we did! And yes we stopped at the market! i love visiting Christmas markets and yours is quite special =o) Look out for my Toronto post coming soon! Great list of winter essentials - I especially love the warm Columbia socks. Have a great time in Toronto! Totally agree! That's a way too awesome winter essentials. Thank you =o) It's perfect for winter! The scarf is one of my favorite things to wear now =o) Thank you for the sweet comment! We have no winter where I'm from but I do love beanies! I love your picks. Beanies work all over the world =o) Thank you! I agree with you. In these cold and winter days, these choices are perfect to keep you warm. Have a great time in Canada! This is the perfect suitcase for cold weather, the scarf is fantastic. So many great pieces! I love your triangle sweater! Have an amazing time in Canada - I can't wait to see the photos! That's such a cute beanie! Love the bag, seems very handy, love your blog as well, thank you for sharing!!! Thank you for the sweet comment =o) The bag was perfect for the trip! Thank you! We had a blast in Toronto =o) Look for a post coming up soon! Very cute beanie and the backpack looks nice, haven't seen something like it for quite sometime. Haha I have gotten a lot of compliments on it =o) Thank you! I love this flat lay! I need some warm winter socks, I think I will try out your Columbia one, and your mittens are super cute too! Chicago is freezing in the winter, I’ve never experienced anything like it in my life, but I’m also a California Girl so anything lower than 50 degrees freaks me out. I need that beanie; it’s super cute. Thank you =o) They kept me warm in Toronto! I love your scarf, it looks perfect! You definitely need hats and gloves at this time of year! These are such cute essentials! Thank you for the sweet comment =o) Happy new year! So cozy. Love the look of all the items, especially the top and mittens! okay I am a little late on your posts, sorryy!! I saw that you had an amazing time in Toronto. Nice packing! I would totally include a "touch gloves", it makes easier to take quick photos with your phone without freezing your hands haha.